When I saw on Facebook that illustrator Kelli Thrasher-Brooks had a new postcard ready, I knew she’d have to come share it with the Sub It Club. 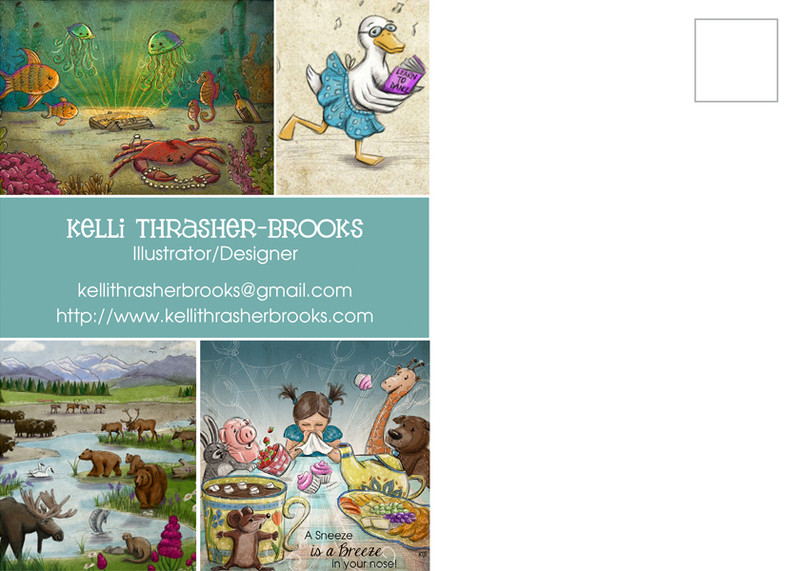 Colors, textures, lines, patterns and characters play a large role in Kelli’s passion for creating picture books. Ideas for new stories come from everywhere and she is often inspired by her children. When she has a strong character concept she draws them over and over loosely with a lot of layers and emotion until they come to life. She paints many textures with her children and scans them in to add depth to her illustrations in Photoshop. When she draws with ink and watercolor pencils, she uses just a small amount of saliva and a Q-tip to blend the colors perfectly since water often makes them muddy. 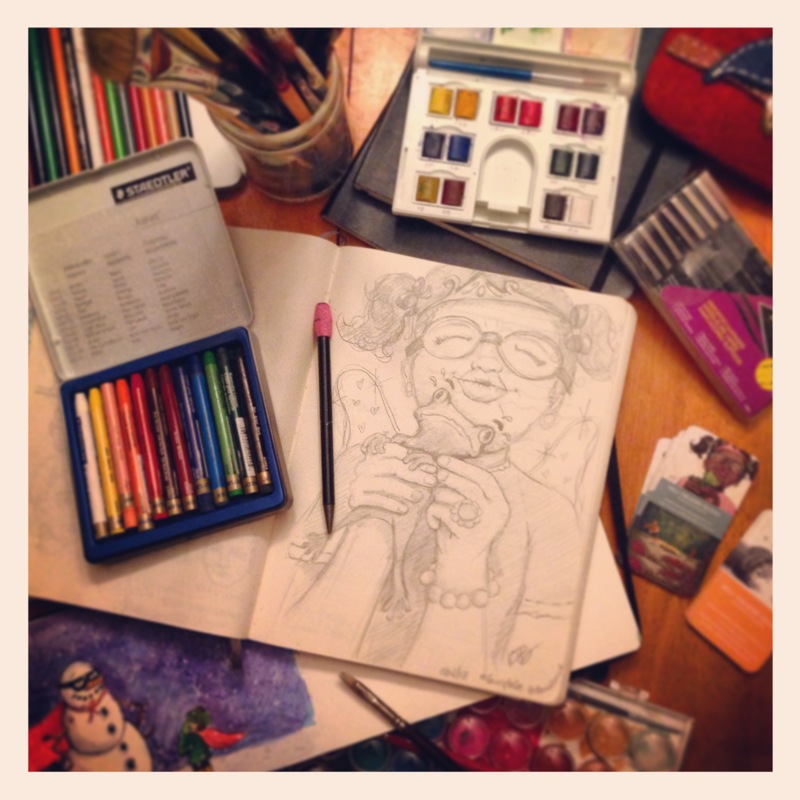 It’s like every drawing has a personal piece of her life in it… literally! Kelli attended the Art Institute of Philadelphia from 6:00-10:00 every night and worked for ad agencies full time during the week to pay her way through college. After graduation, she jumped right into advertising and has been in the field for over 16 years now. Beginning in 2007, bedtime stories with her children enhanced her storytelling skills and appreciation for picture books all over again. Her children love to add on to the stories each night and color her custom coloring pages as well. In 2009 she joined SCBWI and a new world opened her eyes. It was a home that she never realized that she was missing. It blended perfectly with her love of picture books, the desire to create stories and make a difference in lives. Most images in my portfolio are like little seeds of stories that I am working on. I test out images in different ways to see what gets a good reaction. Facebook, Twitter, and Instagram are helpful resources. The most recent image on my postcard has been popular for a while now and was even featured on Harold Underdown’s Facebook page on September 1, 2013. I used to cram in a lot of information when I was more insecure with my work. It has taken a few years to realize that the art and stories speak for themselves. Previous postcards used to have anywhere from 5-10 images crammed on the front and back, but now I use one strong image on the front with my name, and the back of the card has four favorites with important contact info. If they want to see more, they’ll visit the website. This is the back of the postcard. Kelli has capitalized on this space with four great images. I love to create stories that make me happy. If I get a good reaction from an illustration I might use it, but your gut always lets you know. I’ve created illustrations and manuscripts that I wanted to love, but I knew they were not quite right. Art directors and editors want to see your best work, and if you are not sure… leave it out. Quality is more important than quantity. * You will accumulate better pieces over the years, so don’t rush it. I only create one card at a time. Postcards are often shared in the slush pile so you would think it would be nice to send a different card to each person, but I personally think that if they saw the same image in the pile a couple of times, it might get noticed more or show that more than one person likes the image. I have not sent out many postcards so far. I used to send a couple during the holidays to personal contacts, but I have been focusing more on creating a specific mailing list… quality not quantity. I have either met them, been influenced by them personally or have researched the contacts in my mailing list based on the books that they have worked on. I can also see my style working well in the mix of their current artists. *Ha! You can say that again! I have been working on the list for a few years. Everyone’s list is going to be different based on your taste in books and comfort level. I tend to mail to art directors and editors. I have gotten to know a few people from Highlights after attending the Advanced Illustrator Workshops in 2012 and 2013, so I usually mail a postcard to them as well. Lists can be so overwhelming. Still trying to find a good formula… For now I use a spreadsheet that I created in free program called Open Office, which is just like Microsoft Word and Excel. I have a row across the top broken up into columns for: Publisher, Title, First, Last, Address, City, Zip, Phone, Email, Updated and Notes. Then down the left hand side of the page under “Publisher” I have sections separated by each publisher and imprint. 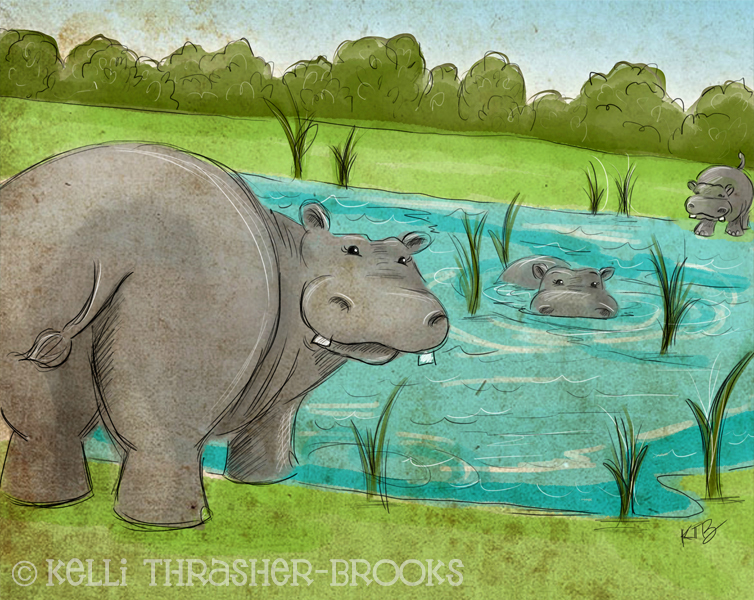 I sometimes illustrate on paper, and then scan it in to color in Photoshop, and add in textures that I have painted. Drawing in Photoshop with the tablet is fun and I feel like I am a bit looser with my lines, so sometimes I just start an illustration there. The graphic designer in me defaults to InDesign for all layout purposes though. It keeps the files smaller and you can move around text and photos more easily. As long as you send the printer a PDF with correct bleeds and dimensions you should be okay. I love working with Overnight Prints. The quality has been great so far, and they are fairly quick. The cost is helpful too! I LOVE Moo‘s cardstock though, and the feel of their cards is always noticeable. If I’m going to an SCBWI conference I usually print a set from them as well. Thanks so much for all the tips and beautiful artwork, Kelli! 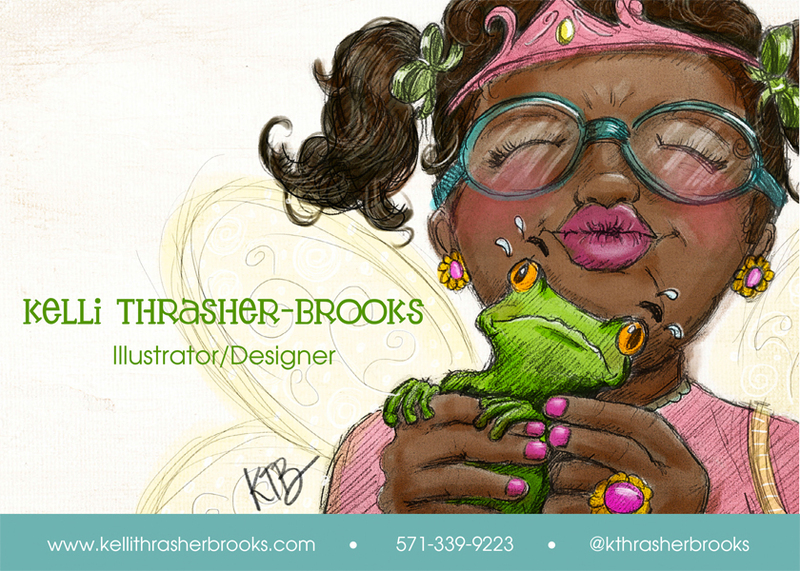 Kelli Thrasher-Brooks is an AMAZING artist! It was an honor to meet her in person in Philly! You are very inspirational. Thank you. Beautiful art. Thank you all for the sweet comments! There are so many different ways to go about submissions. I’m still figuring it out also, so this is such a great blog to refer back to often!